First, I want to point out that you should never just respond to BAD reviews. You should make a point to respond to EVERY review, whether good or bad, at all times, when appropriate. Even in the cases where nothing was said but someone left you stars--respond. Encourage additional feedback in situations where nothing was said by prompting the reviewers with questions about the product/services they received. All reviews (especially ones that reference your products and services) help your local SEO rankings as well as providing potential leads with more information about what you do. There are few things more frustrating than someone tainting your business’s reputation, especially if they didn’t do business with you and are pretending they did. That’s called a fake negative review, and you know what? You can remove it. That’s right. 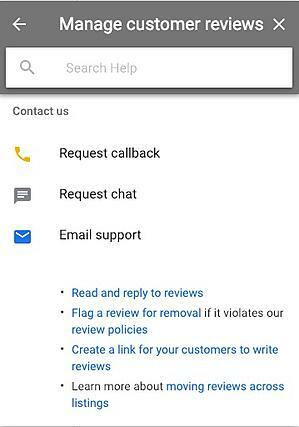 It’s not as easy as clicking “remove,” but you do have the ability to remove any reviews that violate Google’s policies for leaving reviews. That includes the removal of fake reviews from people who never did business with you. There are a few different ways to do this. Obviously, negative reviews are not always fake. You may run into reviews that were left by legitimate customers that had a poor experience. Don’t ignore these. Respond to the review on Google, and then follow-up with that unhappy customer with a phone call to ensure they feel heard and try to remedy the situation. Are they in your CRM or point of sale software? If not, they likely aren’t a customer. Are they on record for contacting customer service? If not, recommend they do so in your response with a direct link to contact customer service. Do they lack specific details such as which employee helped them? They may just not remember the name of the employee, but typically if someone has a bad experience they take note of names. Have there been an influx of negative reviews in a short amount of time? It could be that a competitor or spammer is after you. Did the reviewer recommend a competitor in their negative review? This is usually a clear indicator that a competitor is behind the review. There are a couple of ways to get rid of those pesky fake reviews. Go to the review on Google Maps. 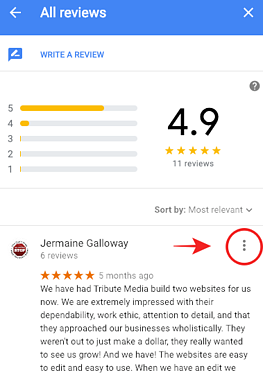 Click on the three vertical dots in the top right of the review (see image), and then click “Flag as inappropriate.” DO NOT CHOOSE THIS UNLESS YOU ARE SURE IT IS FAKE. Google will penalize you if you have an excess of reviews that you are flagging and they turn out to be legitimate. If a competitor is behind the fake negative reviews, obviously the mature and professional first step is to contact them and request that they stop the activity and remove the fake reviews. If they don’t, you always have the option of reporting them to the Better Business Bureau and your local Chamber of Commerce. Spam and fake content: Any false content intended to boost rankings falls in this category. Off-topic: If the content includes irrelevant personal, social, or political commentary, it can be removed. Conflict of interest: You cannot review your own business, or have employees review your business or a competitors business. Make sure you’ve compiled enough information to support your case and send it off. If you have enough evidence to prove the review is slander against your company, you can fill out Google’s legal removal request form. If the complaint has been deleted, but it’s still showing up in Google search results, submit the link here in Google’s Search Console. When it comes down to it, positive reviews have the power to drown out negative reviews. Always be asking your happy customers to leave Google reviews about your products and services! These positive sentiments can go a long way in convincing others to do business with you and they also greatly contribute to your local SEO. In closing, always be on alert for reviews on Google, Facebook, Yelp, and other review platforms. The more on top of your reputation you can be, the better!